With 775 000 apps on the app store, how do you get your app discovered? There used to be a time when each time you released an update or a new app, your app would showcased on the front page of the latest apps released in a particular category page. As a result you could expect a sales bump from being showcased on that page, until other apps moved you down that list. This is the most important tool at your disposal. 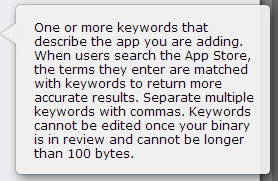 Apple allows you to enter a limited set of keywords totaling up to 100 characters. Additionally, you can only change your keywords when submitting an update to your app, so choose wisely! So how do you know what keywords to select from? There are multiple ways to do this. What problems does your app solve? List the keywords related to the search terms that users might use to find apps that solve this problem. What apps are you competing with? Run searches on the app store using the keywords you have in mind now, and see what apps show up now for those keywords. These are the apps you will be competing with. If the apps you think you should be competing with don’t show up in searches for your chosen keywords, then you will need to experiment some more. Maybe they are using a different set of keywords than you are? Decide if those are the keywords you should be using. Apple uses its own algorithm to determine what apps to show first, when a user searches for particular keywords. Keywords in your app title probably count more than keywords just in your keyword list. Additionally, app results may show based on popularity – so if a competing app that is more popular has submitted the same keywords, then it may show higher in the list than your app. After your app is live, search for the keywords you have specified in the list, and see where your app ranks when users search for that keyword. 3rd party tools are available that can provide you daily results of your appstore SEO rankings to see how you compare with competing apps. Here is the key: If you are not ranking significantly for particular keywords, then don’t use them in your keyword list. You only have 100 characters of keywords available to you, so might as well use those for keywords that you actually rank for than ones that you don’t. Try switching to a less competitive keyword that you do rank for instead. It is better to show up in the search results for a less searched (long tail) keyword, than to not show at all for a high volume keyword. So search for all the keywords you have specified, and remove the ones and replace with alternate versions for the ones where you do. If your app shows up on any of the top selling lists, it is more likely to be discovered and then purchased / downloaded. So when deciding what to price your app at keep in mind that a lower price usually leads to more downloads, which means a better chance for your app to rank in its category. Also, keep in mind that the app store ranking for each country is different, so just because you don’t rank in one store, doesn’t mean that you can’t rank in a different store. When users are viewing apps they are interested in, Apple provides a list of similar apps below that. The algorithm for what apps show here has not been made public. However, this is another benefit of having more downloads, in that there is a greater chance that your app will be recommended, when users download similar apps. Apple has many curated lists of apps in each category, such as New and Noteworthy and apps that highlight different features of the phone. There is no direct way to get onto these lists, other than to have an app that is already generating some buzz, well rated with a good design and an eye catching icon. Again, note that it is possible to get rated in some country specific app stores and not others. Not happy with your rankings? Want to increase the number of reviews you have? Want to generate some overall buzz? Want to increase the chance that your app will be recommended when users view a similar app? You can do so by running a promo on your app. Temporarily have a sale or even make it free to coincide with a time of year, or pick a random reason to. Promote these deals on your social media sites. Additionally, there are a lot of 3rd party sites that automatically highlight apps that are on sale. Users on sites like that can even choose to be notified when apps they are following are on sale. Take a look at what running such promos did to app downloads for one of my apps sometime back (2 promos were run that year – can you tell when they were run?). In addition to the efforts you make to increase your discoverabilty on the app store – make sure you also focus your efforts outside the app store. Submit your app to review sites, run targeted ads, write guest posts on targeted blog sites, post your promos on social media etc. All of these can link to your app on the app store, increasing its downloads, thereby helping your discoverability. Thanks Adarsh. This will surely give new Tips to Apple App developers. Launching Video demos and Intro Videos can also Help to Get App in the Top of the Tables. Thanks Ravi. Yes, videos are very useful as well. I’ll do a future post on that.